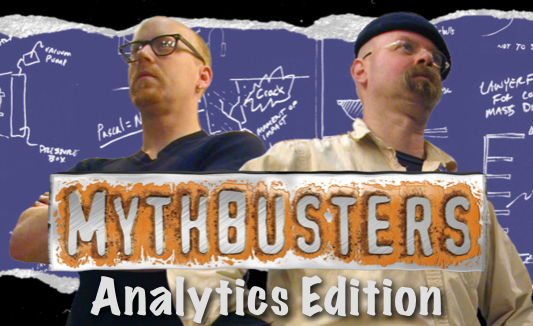 Earlier this month, I gave a presentation at the Columbus Web Group meetup that I titled Mythbusters: Analytics Edition. The more I worked on the presentation — beating the same drums and mounting the same soapboxes I’ve mounted for years — the more I realized that the Discovery Channel show is actually a pretty useful analog for effective digital analytics. And, since I’m always on the lookout for new and better ways to talk to analysts and marketers about how to break out of the soul-sucking and money-wasting approaches that businesses have developed for barfing data and gnashing teeth about the dearth of “actionable insights,” this one seemed worth trying to write down. Note: If you’re not familiar with the show…you can just bail on this post now. It’s written with the assumption that the reader actually knows the basic structure and format of the program. The show’s opening credits roll. Jamie and Adam stand in their workshop and survey the tools they have: welding equipment, explosives, old cars, Buster, ruggedized laptops, high-speed cameras, heavy ropes and chain, sheet metal, plexiglass, remote control triggers, and so on. They chat about which ones seem would be the most fun to do stuff with, and then they head their separate ways to build something cool and interesting. Jamie and Adam are now out in a big open space. They have a crane with an old car suspended above it. They have an explosive device constructed with dynamite, wire, and a bunch of welded metal. They have a pole near the apparatus with measurements marked on it. They have a makeshift bomb shelter. They have high-speed cameras pointed at the whole apparatus. They get behind the bomb shelter, trigger the crane to drop the car and, right as it lands on the explosive device, the device goes off and blows the car up into the air. This is how we’ve somehow managed to train ourselves to treat digital analytics!!! 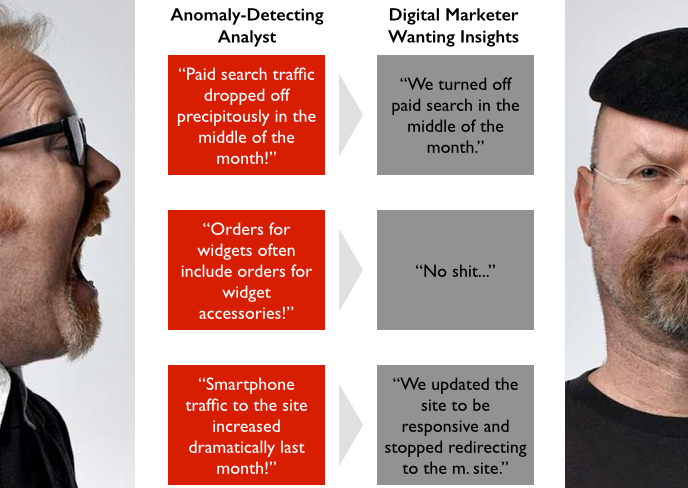 We produce weekly or monthly reports and expect them to include “analysis and insights.” Yet, like the wrongheaded Mythbusters thought experiment above, we don’t actually ask questions that we want answered. A well-known (or obscure) belief, urban legend, or myth is identified. 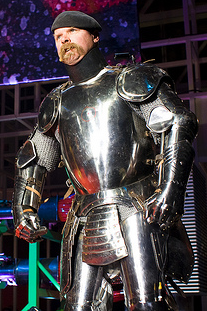 The Mythbusters team develops a plan for testing that myth in a safe, yet scientifically valid, way. They experiment/construct/iterate as they implement the plan. Granted, the myths they’re testing aren’t ones that lead to future action (just because they demonstrate that a lawn chair with a person on it can be lifted by balloons if you tie enough of them on doesn’t mean they’re going to start promoting a new form of air travel). But, aside from that, the structure of their approach is exactly where marketers could get the most value. It is nothing more and nothing less than a basic application of the scientific method. Sadly, it’s not an approach that marketers intuitively follow (they’re conditioned not to by the legacy of bloated recurring reports). And, even worse, it’s not an approach that many analysts embrace and push themselves. The analyst assesses the idea and figures out the best option for testing it, either through digging into historical web analytics or voice of the customer data or by conducting an A/B test. So clear. So obvious. Yet…so NOT the mainstream reality that I see. I have a lot of theories as to why this is, and it’s becoming a personal mission to change that reality. Are you on board to help? It will be the most mundane revolution, ever…but, who knows? Maybe we’ll at least come up with a cool T-shirt. My best luck has been multi-pronged: 1) relationship/credibility/trust-building with stakeholders, 2) Education-education-education of business users (but in bite-sized and engaging ways — like talking about Mythbusters), 3) shifting the structure of legacy recurring reports to promote a dialogue rather than a data-puke. Every organization is different, but it starts with recognizing that the current way isn’t working and being open to shaking things up and doing thing differently. And, boy, getting to that starting point can be a BEAR — it’s against human nature to admit that what we’ve been doing month in and month out is actually not delivering value commensurate with the cost.